Chess, checkers, and backgammon are all classic staples of challenging board games. Mancala, however, is even older than those, dating back to 500-600 AD. You might have seen this game in stores, but never knew what it was about. Mancala is a strategic game of math and positioning. Its simple appearance belies its deep and challenging qualities. It's a game that's great for all ages, even young children. This can be a great activity idea for parents or teachers looking to keep kids engaged and sharpen their cognitive skills. For more information, keep reading about this ancient board game and how it works. Like most board games that deal with positioning and counting, mancala requires lots of concentration. Players will require both abstract and deductive reasoning to gain advantages. Mancala has multiple variants, which differ in skill level. Its simple design means that anyone in the world can play it without needing to buy set pieces. You can use various containers, seeds, beads, beans, or rocks. The barrier for entry is low, which is why it is one of the most internationally-accessible games. Mancala is a fun activity in the classroom. The gameplay is easy to pick-up and doesn't require a lot of unique pieces like others. It has been used as a teaching counting tool for centuries in Africa. All variants of mancala share the basic playing pieces: counting pieces and containers. There are two large containers that serve as captured pieces, while the middle contains rows of smaller ones. The game begins with the center rows filled with seeds of a predetermined amount. Each player takes a turn "sowing" a chosen row of seeds by picking up a group and spreading them into adjacent containers. The concept is simple, but capturing more seeds than your opponent can get tricky. The game rules will vary based on which variant of Mancala you are playing. The two main variants are Kalah for beginners and children, Oware for older and experienced players. When you're playing Mancala in the U.S., you're likely playing by Kalah rules. This is the default variant to introduce new players. This variant starts with two rows of 6 containers, also called houses. You each get your own storage for captured pieces. Each house will hold four seeds, totaling 12 houses with 48 pieces. One player begins the game by taking seeds from their first house and sowing them in a counter-clockwise position. One seed in each house, dropping the last one into their stores, if they come across it. A seed into the storage grants another turn. This process continues until no more seeds can be sewn and a final tally is counted. Sounds easy, right? Well, the rules of Kalah are what make it exciting. Firstly, you can't drop seeds into another's storage, for obvious reasons. Dropping your last seed into an empty pit means you get all the seeds next to it and the last seed dropped. If you run out of seeds on your side of the board, the opponent gets to gather all their seeds on their side. When it comes to strategy, you're going to have to pay attention to where you choose to start your sow. If you play the sides, you may end up with empty houses in the middle. If you play the middle, you will shuffle seeds to the sides. Movements must be made for your benefit and the opponent's detriment. Shift some of their seeds to your side and migrate them to your storage. While Kalah can be played for hours without getting boring, adults may want something more competitive. Oware is the Chess as Kalah is to Checkers. It is recommended for players 11 years old and up. The board is identical to Kalah, two rows of 6 houses, 4 seeds in each house, and storage pits. You will also be sowing seeds in the same fashion. The game begins with each player taking seeds from their closest house and sowing them counter-clockwise. Oware breathes new life into the game by changing the requirements of capturing seeds. You won't be dropping seeds into the storage pits from the act of sowing. In order to capture, you need to end your move in one of the opponent's houses. Not only that, but you need to do it in a specific order. When you end your move in their house, you need to have 2-3 seeds in it to capture. Not one, not four, but 2-3 seeds. If you don't have the necessary seeds in it, then your turn is up. If you do get to capture those seeds, you will continue and look at the next-to-last house of your opponent. If it has 2-3 seeds, you get those seeds, too. This opens up a whole new world of strategy on the Mancala board. The long-term strategies open up further and mistakes can turn the tide permanently. Oware can also expand into larger playing fields for even more challenge. Mancala is a game that should be a staple in any family game night collection. It offers a great pick-up and play opportunity needing little explanation. Like Checkers, it is easy to remember; like Chess, it is hard to master. Mancala is also playable in a group setting. 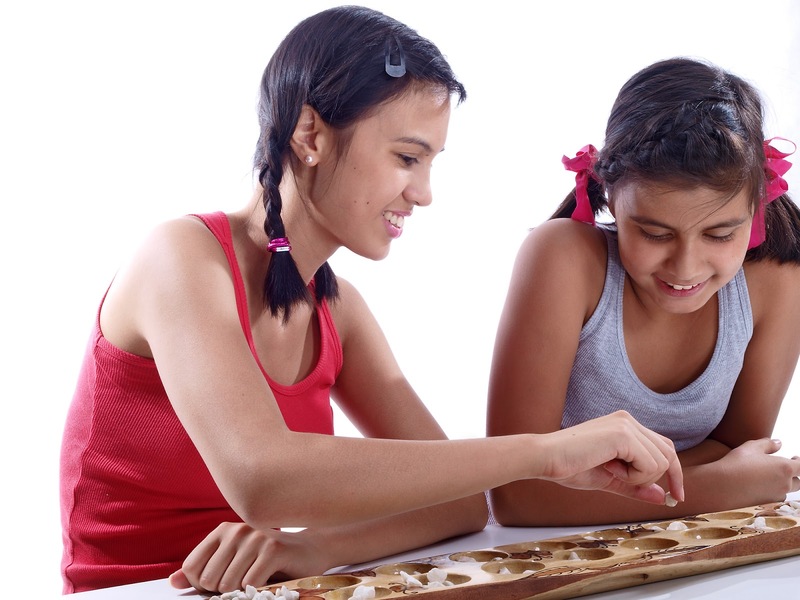 There are team Mancala boards where multiple players work together to beat the other side. This is where lots of comraderies and team sports traits can surface. Put together your family board game night with help from our guide here at MancalaGames.net. We have all the information you'll need to get started.